Goals by Steven Naismith and substitute Nacho Novo against Queen of the South put Rangers through to the Co-operative Insurance Cup quarter-finals. In perfect conditions in front of a capacity crowd, the home side battled gamely and a Derek Holmes overhead kick demanded a top save by Neil Alexander. 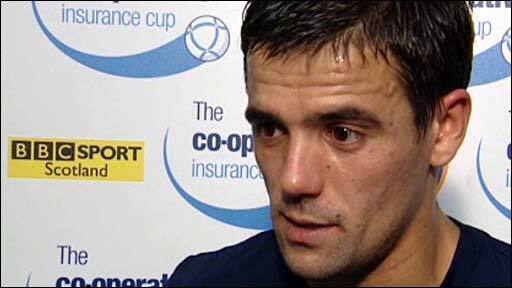 Kris Boyd's low cross invited Naismith to side-foot home in 16 minutes, then Novo blasted a late second for Rangers. Queens' Robert Harris curled in a great consolation goal in injury time. 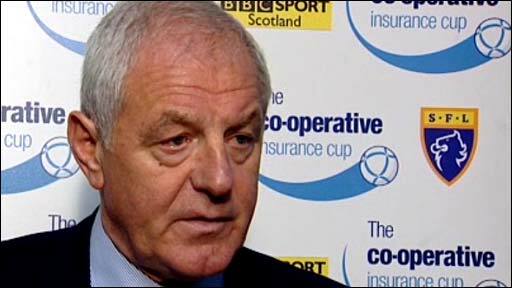 Walter Smith sent out a strong team at Palmerston Park, mindful perhaps of the tough opposition Queens provided in the 2008 Scottish Cup Final but more likely limited in his options by the pruning to his squad brought about by financial necessity. Rangers had the best of the first half hour, Steven Whittaker sounding a warning when he powered a header over the bar from a Jerome Rothen corner in 12 minutes. With the Queens defence lining up in an advanced position in their own half, Pedro Mendes and Boyd combined for the opener for Rangers, the Portuguese midfielder cutting inside on the right flank and sending a reverse ball down the wing with the outside of his right boot. If it was an unusual sight to witness Boyd scampering in pursuit of Mendes's pass, the result was more familiar as his perfectly weighted low cross was met by Naismith to side-foot home from six yards. A superb defensive challenge by David Lilley prevented Naismith from doubling his side's advantage after Mendes had released the Scotland striker in the inside-left channel. Errors by David Weir were once collectors' items but a few have been creeping into his play recently. The Ibrox captain made a slack defensive pass that was pounced on by Holmes but the Queens striker made a hash of his effort. With "simulation" in the news in recent weeks, Boyd dived to the turf in the penalty box after a 50-50 challenge with Ludovic Roy midway through the first half. The centre-forward's apologetic gesture to referee Willie Collum as he produced a yellow card told the story. 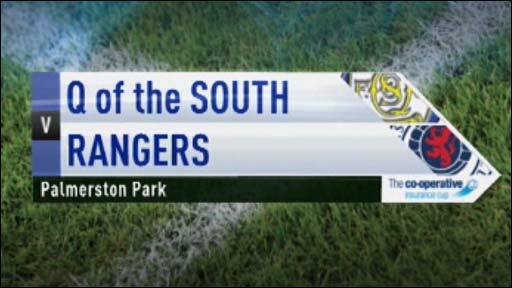 The Doonhamers had a number of chances towards the end of the opening period. Holmes won a challenge in midfield and released David Weatherston down the right wing. With Madjid Bougherra blocking his path to goal, Weatherston cut the ball inside for the advancing Holmes but the home side's number nine screwed his left-foot shot wide. Ambition outweighed technique when Steven McKenna attempted a long-range shot which trundled by Neil Alexander's right-hand post and a good header by Holmes under pressure from Whittaker ought to have kept the SPL champions on their toes. But Gordon Chisholm's side's best chance was yet to come and Weatherston will doubtless relive the moment that presented him with the chance to level the tie. With five minutes to half-time he broke from the halfway line and beat Bougherra to the ball in time to send a lob over the head of the helpless Alexander, but he was grasping his head in exasperation seconds later as the ball bounced a yard wide. And it was Weatherston who looked liveliest at the re-start when he and Holmes carved their way through the centre of Rangers defence, but Alexander, in for Allan McGregor, blocked the striker's shot with his feet. Kevin Thomson interrupted 10 minutes of pressure from the First Division side when he thumped a left-foot shot on target from 25 yards which Roy tipped over, then Papac connected too thinly with a Rothen cross. Yet the aggression and enthusiasm of the Doonhamers, backed by 4,000 of their fans in the sell-out crowd, meant the Ibrox side would have to fight to retain their one-goal advantage. A dark moment for the home side was a serious injury to Steve Tosh, whose left ankle was forced into a horribly unnatural angle when his boot caught in the turf. Tosh's replacement Rocco Quinn was presented with a chance to level moments after coming on, but he headed over the bar as he struggled to keep his balance. There was a decidedly Gallic flavour to the next piece of action as Rothen's free-kick on to the head of Bougherra was tipped magnificently over the bar by Roy and the Queens stopper was alert to a downward header by Boyd soon after. Harris was entrusted to provide troublesome deliveries from set pieces and his free-kick in the 72nd minute resulted in a tremendous overhead kick by Holmes which was saved by Alexander to give Queens their first corner of the match. Rangers' decisive second was harsh on the Doonhamers, whose verve probably deserved an additional 30 minutes of play. Super-sub Novo, with five minutes under his belt after his introduction for Rothen, was off and running when Steven Davis picked him out in the inside-right channel. Racing into the box, he sized up the position of Roy and despatched the ball inside the post for his eighth goal in the League Cup for Rangers. Former Ibrox youth player Harris will take a great deal of pleasure from his stunning goal in the 91st minute. The Queens player picked up the ball at the edge of the box and his left-foot shot curled into the top corner of the net to set up a nervy last three minutes. 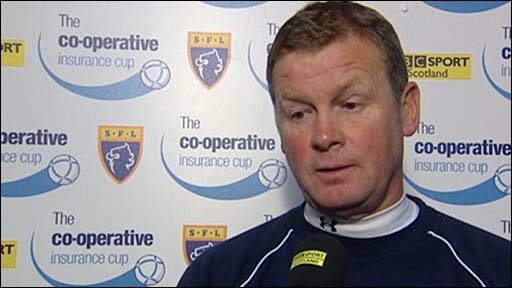 Queen of the South manager Gordon Chisholm: "Over the piece I thought we were unlucky, we acquitted ourselves very well. "I was disappointed at the goals we gave away. At 1-0 we started to impose ourselves on the game. "The boys at the back are disappointed at both goals. We tried to step up and play offside and that is something we don't normally do. "Credit to the boys. I have nothing but praise for them. I think we deserve a lot of credit. "I thought the overall performance from them all and the effort was first class." Rangers manager Walter Smith: "The first half hour of the match I thought we played very well. After that, Queens started to come in to the game. "We were pleased to get the second goal but in the second half I was disappointed with the slackness we had. "We knew it was going to be a difficult game. They set their team out well. "When they came back into the game, the opportunities were a bit of untidy play from our point of view but you always give the opposition credit for taking advantage of anything that happens. "In the end you're happy to come through what was always going to be a difficult cup tie." 90:00+4:34 The game is over, as the referee blows his whistle. 90:00+3:37 Foul by Nacho Novo on Craig Reid, free kick awarded. Ludovic Roy takes the indirect free kick. 90:00+2:46 Madjid Bougherra crosses the ball. 90:00+2:02 Rocco Quinn takes a shot. David Weir gets a block in. 90:00+0:42 GOAL - Robert Harris:Queen of South 1 - 2 Rangers Robert Harris finds the net with a goal from outside the penalty area to the top right corner of the goal. Queen of South 1-2 Rangers. 89:17 Paul Burns produces a cross, clearance made by Madjid Bougherra. 86:20 Neil Alexander takes the free kick. 86:20 Substitution Lee McCulloch joins the action as a substitute, replacing Kris Boyd. 86:20 The assistant referee flags for offside against Paul Burns. 85:28 Steven Naismith takes a shot. Save made by Ludovic Roy. 85:08 Pedro Mendes decides to take the corner short. 84:48 Sasa Papac takes a shot. Blocked by Marc McAusland. 84:20 Pedro Mendes takes a shot. David Lilley gets a block in. 82:40 Substitution Gerry McLaughlan replaces David Weatherston. 80:36 Centre by Paul Burns, save by Neil Alexander. Correction - 78:23 Steven Davis provided the assist for the goal. 78:23 Assist by Steven Whittaker. 78:23 GOAL - Nacho Novo:Queen of South 0 - 2 Rangers Nacho Novo gets on the score sheet with a goal from inside the box to the bottom right corner of the goal. Queen of South 0-2 Rangers. 77:53 Rocco Quinn delivers the ball, clearance made by Madjid Bougherra. 76:48 Corner taken by Robert Harris from the right by-line to the near post, Nacho Novo manages to make a clearance. 76:42 The ball is crossed by Steven Davis, blocked by David Lilley. 76:01 Nacho Novo produces a right-footed shot from a long way out which goes wide right of the goal. 73:47 Substitution Nacho Novo is brought on as a substitute for Jerome Rothen. 73:25 Rocco Quinn takes a inswinging corner from the left by-line to the near post. 72:23 Paul Burns fouled by Sasa Papac, the ref awards a free kick. The ball is delivered by Robert Harris, overhead kick right-footed shot by Derek Holmes. Save made by Neil Alexander. 72:04 Pedro Mendes sends in a cross, save by Ludovic Roy. 71:01 Substitution Jamie McQuilken is brought on as a substitute for Barry Wilson. 70:28 Madjid Bougherra is flagged offside by the assistant referee. Ludovic Roy restarts play with the free kick. 70:23 Madjid Bougherra sends in a cross, clearance by David Lilley. 70:10 Rocco Quinn takes a shot. Madjid Bougherra gets a block in. 68:50 Centre by Steven Whittaker, Kris Boyd takes a shot. Save by Ludovic Roy. 68:24 Jerome Rothen produces a cross, Paul Burns makes a clearance. 67:55 Foul by Steven McKenna on Jerome Rothen, free kick awarded. Sasa Papac takes the direct free kick. 66:56 Corner taken by Jerome Rothen, save by Ludovic Roy. 66:16 David Lilley challenges Kris Boyd unfairly and gives away a free kick. The ball is crossed by Jerome Rothen, Madjid Bougherra takes a shot. Save by Ludovic Roy. 65:21 The ball is delivered by Barry Wilson, Rocco Quinn produces a header from inside the area that goes over the crossbar. 64:53 Jerome Rothen produces a cross, Robert Harris makes a clearance. 63:27 Substitution Rocco Quinn on for Steven Tosh. 58:51 Centre by Jerome Rothen, Header by Sasa Papac from deep inside the penalty area misses to the right of the target. 58:09 Shot by Barry Wilson from just outside the area goes over the net. 55:38 Corner from left by-line taken by Pedro Mendes. 55:24 Kevin Thomson takes a shot. Save by Ludovic Roy. 55:03 Robert Harris delivers the ball, Steven Whittaker manages to make a clearance. 54:33 Sasa Papac concedes a free kick for a foul on Barry Wilson. Robert Harris takes the free kick. 53:46 The ball is crossed by Barry Wilson, Madjid Bougherra makes a clearance. 53:12 Madjid Bougherra takes a shot. Blocked by Marc McAusland. 51:14 Foul by Sasa Papac on Derek Holmes, free kick awarded. The free kick is delivered left-footed by Robert Harris from right channel, clearance by Sasa Papac. 50:13 Craig Reid sends in a cross, Kevin Thomson manages to make a clearance. 48:54 The ball is delivered by Paul Burns. The referee blows for offside. Free kick taken by Neil Alexander. 48:34 Barry Wilson sends in a cross, Neil Alexander makes a save. 47:20 David Weatherston delivers the ball, Madjid Bougherra manages to make a clearance. 46:30 David Weatherston takes a shot. Save by Neil Alexander. 45:24 Foul by Steven Tosh on Pedro Mendes, free kick awarded. Madjid Bougherra takes the free kick. 45:00+0:07 The players leave the pitch at half time. 44:38 Robert Harris challenges Steven Naismith unfairly and gives away a free kick. Kevin Thomson restarts play with the free kick. 44:29 Craig Reid delivers the ball, Pedro Mendes makes a clearance. 43:43 Jerome Rothen produces a right-footed shot from outside the penalty box and misses right. 40:55 Effort from just outside the area by David Weatherston goes over the target. 40:41 The ball is delivered by Jerome Rothen, Marc McAusland makes a clearance. 40:28 The ball is swung over by Jerome Rothen, Marc McAusland manages to make a clearance. 39:26 Free kick awarded for an unfair challenge on Kevin Thomson by Barry Wilson. Neil Alexander takes the free kick. 37:53 Effort on goal by Paul Burns from deep inside the area goes harmlessly over the bar. 36:20 Steven Davis gives away a free kick for an unfair challenge on Robert Harris. Free kick taken by Robert Harris. 35:40 Steven Tosh delivers the ball, Headed effort from close range by Derek Holmes goes wide left of the goal. 34:03 Madjid Bougherra sends in a cross. 33:16 The ball is sent over by Jerome Rothen, Ludovic Roy makes a comfortable save. 32:45 Steven McKenna has an effort at goal from long range that goes wide left. 31:33 The ball is sent over by Jerome Rothen, clearance by Robert Harris. 29:37 Free kick awarded for an unfair challenge on Steven Naismith by David Lilley. The free kick is delivered left-footed by Jerome Rothen from left channel, save by Ludovic Roy. 29:05 Derek Holmes produces a left-footed shot from the edge of the area and misses to the left of the goal. 26:31 David Lilley gives away a free kick for an unfair challenge on Steven Naismith. Pedro Mendes restarts play with the free kick. 25:42 Ludovic Roy restarts play with the free kick. 25:14 Booking Kris Boyd goes into the book. 24:24 Sasa Papac delivers the ball, clearance made by Paul Burns. 21:07 Steven Naismith takes a shot. Blocked by David Lilley. 19:51 A cross is delivered by Paul Burns, save by Neil Alexander. 19:07 Steven Whittaker produces a cross, clearance made by Marc McAusland. 18:03 Craig Reid gives away a free kick for an unfair challenge on Pedro Mendes. Free kick crossed left-footed by Jerome Rothen, David Lilley manages to make a clearance. 17:21 Inswinging corner taken right-footed by Pedro Mendes from the left by-line to the near post, clearance by Derek Holmes. 16:53 Foul by David Lilley on Jerome Rothen, free kick awarded. Kevin Thomson takes the direct free kick. 15:18 Assist on the goal came from Kris Boyd. 15:18 GOAL - Steven Naismith:Queen of South 0 - 1 Rangers Steven Naismith fires in a goal from close range to the bottom left corner of the goal. Queen of South 0-1 Rangers. 13:15 Foul by Steven Whittaker on Paul Burns, free kick awarded. The free kick is delivered right-footed by Steven Tosh from left channel, clearance by Kris Boyd. 12:46 Steven Davis produces a cross, comfortable save by Ludovic Roy. 11:37 Derek Holmes challenges Madjid Bougherra unfairly and gives away a free kick. Madjid Bougherra takes the direct free kick. 10:40 Corner taken by Jerome Rothen from the right by-line, Header on goal by Steven Whittaker from inside the box goes harmlessly over the target. 9:54 David Weir sends in a cross, clearance made by Marc McAusland. 8:46 Derek Holmes fouled by Madjid Bougherra, the ref awards a free kick. Barry Wilson restarts play with the free kick. 7:41 Unfair challenge on Steven McKenna by Steven Naismith results in a free kick. Ludovic Roy restarts play with the free kick. 4:15 Shot from just outside the box by Kevin Thomson misses to the right of the target. 4:07 Centre by Steven Davis, clearance made by Steven McKenna. 3:29 Centre by Steven Davis, Marc McAusland makes a clearance. Correction - 0:36 Inswinging corner taken left-footed by Jerome Rothen from the right by-line, clearance made by David Lilley. 0:36 Barry Wilson takes the inswinging corner, clearance made by Sasa Papac. 0:00 The game gets underway.